It was sometime in December of 1971 when it was announced that the Battle of the Bands would be held in February. We were all sitting around getting high and listing to the Allmans, when someone said "Why don't we start a band and do all Allman Brothers tunes"? It was a spark. What a great idea! Harris played guitar, Mike played drums and I was the keyboard player (I still did not have a keyboard yet, but that was not going to stop me). We had half the band. 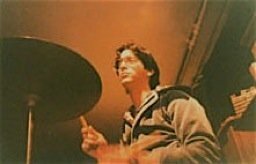 We heard that Neils band had broken up so we asked Mark Garfinkle to be the other drummer. For all you Greatful Dead freaks, fhe Famous Wall in Scotts Room. Painted by Gary Kroman who later went on to do work for Spiderman comics. It took several months to complete. An amazing piece of artwork. Can you imagine what this wall looked like under a black light while you were on acid? He not only said yes but he could also get Russ, the bass player from the old band to play bass. We had everyone except the most important link, someone to do Duane Allmans part. Someone who could play slide guitar as well as killer leads. It was about that time that we called Marv Mitchell. I don't know how we met him (I think it was either from an Allmans concert or some drug deal) but he had a old Les Paul and could play slide guitar. He was also a big Allman freak and had lots of Duane Allmans licks down. Well that was it. We set up shop in Garfinkles basement and started rehearsing. 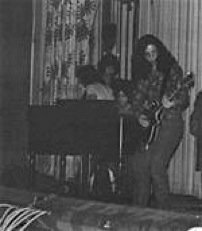 By this time Neil had a Hammond B3 organ and two leslie speakers which he again agreed to let me borrow. In about three weeks time we had five Allman songs worked out. Two of them "Elizabeth Reed" & "You Don't Love Me Boogie" were heavy jams and went on for some time. We figured we had enough material for the half hour set that we were allowed. Then the most difficult decision had to be made. What were we going to call ourselves? Well, it was over twenty five years ago, so my mind is a little fuzzy on exactly how all this happened. Anyway, we were all sitting around trying to think of something and I said, "How about The Grateful Gauchos"? Well everyone hit the floor because "Gaucho" was our favorite word at the time. Gaucho this, gaucho that. A gaucho was someone who would just smoke the entire joint without passing it to anyone. You know the kind! We were all a bunch of gauchos trying to gaucho off of the Allmans fame. 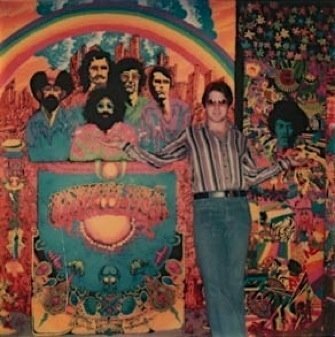 We were also getting to be heavily into the Grateful Dead since Duane had died. And so "The Grateful Gauchos" were born.